After 10 years of continuous challenges and achievements, which have resulted in the saving of thousands of Iraqi children's lives, MAIC faces its second decade with a stronger determination to increase its aid and help more children. 2005 has been a rewarding year for the charity despite the difficult security conditions in Iraq. We successfully delivered several shipments of medicines and equipment to paediatric hospitals in Baghdad and Basrah. We also held our first Forum on 'Health of Children in Iraq' in London. Many crucial issues were discussed by visiting doctors from Iraq, including the alarming rise in child cancers, psychological problems, malnutrition and the spread of disease. Training of Iraqi doctors was another diversification of MAIC's humanitarian aid. Five Iraqi doctors were brought to train in UK hospitals for a period of one month each. This experience helped the doctors update their skills and get acquainted with the latest medical equipment and procedures. The value of this training was multiplied on their return to Iraq as they shared their newly acquired knowledge with their colleagues through seminars and working groups. MAIC is blessed with the rising number of supporters and the increased recognition they bring to the charity's humanitarian work. We value deeply their participation and their efforts which, in 2005, raised £333,666 through donations and fundraising activities. Our forthcoming medical projects include shipments of medicines and surgical items, wheelchairs, medical equipment, and reagents for a radiometer machine that was previously donated by MAIC to Al-Mansour Paediatric Teaching Hospital (now known as the Children's Welfare Hospital). In addition, MAIC aims to continue the training programme for doctors and medical staff this time from Basrah Teaching Hospital. There are also many other projects under consideration for the coming year. Most important among them are lists of urgent medical requests from paediatric hospitals in Iraq that were recently sent to MAIC. We hope that the charity will raise sufficient funds to enable us to sponsor them. We look to 2006 with hope and pray for peace and reconciliation among the Iraqi people. We wish you all a happy and prosperous New Year.  On the 3rd of May 2005, MAIC held a forum on the 'Health of Children in Iraq' at the Royal Geographical Society in London. Over 100 guests attended and were able to hear the experiences of a group of Iraqi doctors working in Iraq. We raised £7,194 through donations and ticket sales.  On Sunday 18th September 2005, five volunteers participated in the annual BUPA Great North Run in support of MAIC and raised £3267. We would like to congratulate them on their excellent effort.  MAIC held its 10th Anniversary Gala Dinner at the Grosvenor House Hotel on the 19th November 2005. We were honoured to have Zaha Hadid, the Iraqi-born British award-winning architect, as our guest speaker. A moving short film commemorating 10 years of MAIC's humanitarian work produced by Maysoon Pachachi was shown. We are grateful to all our supporters and the 250 guests who attended in helping us raise £180,000 through donations, auction, tickets and raffle sales.  Other fundraising events were held by MAIC supporters raising a total of £72,000. 68 packs (454g each) of XP Maxamum powder. the patient travelled to Basrah. The above items were sponsored through the generosity of Give a Child Health Fund, Ms. Nicola Greenwood and Ms. Rosanna Akland. Laboratory equipment including microhaematocrit reader, spectrophotometer and a microscope. including Wechsel, Bayley, Conner and Devereuxs scales and various psychiatry books and manuals. Hospital, Al Tifl Al Markazi, Baghdad. Al-Mullah, Mr. and Mrs. Mustafa El-Solh, Mrs. Carol Djandi, Mr. and Mrs. Ziad El-Khouri, Mrs. Youmna Achour, Mr. and Mrs. Ramzi Rasamny, Mr. and Mrs. Ali Khan, Ms. Tamar Kosta, Ms. Samia Masry, Ms. Lamia Guenena, Mr. and Mrs. Bassam Zaku. And on the occasion of the birth of baby Fadi Zaku through the generosity of Mr. and Mrs. M. Al-Daftari, Mr. Zayhed Mahfooth, Mr. and Mrs. Raed Hanna, Mr. and Mrs. Sami Zakaria, Dr. and Mrs. Zayd Abboudi, Mr. and Mrs. Jihad Tabbara, Mr. and Mrs. Walid Al- Sayegh, Mr. and Mrs. Mohanad Al-Sayegh, Mr. and Mrs. Hassan Allawi, Mr. and Mrs. Ayad Kazanji, Mr. and Mrs. Frady Ofie, Mr. and Mrs. J. Stait, Mrs. J Kabbani, Mr. and Mrs.Walid Moukazel, Mr. and Mrs. Shwan Louis, Mr. Fady Khayatt, Dr. and Mrs. Ayed Kurugy, Mrs. Joanne Khan, Mr. and Mrs. Walid Rashid, Mr. and Mrs. L. Toma, Miss. Hind Toak, Mrs. J. Captain/Rashed, Miss Reem Zako, Dr. and Mrs. L Zebouni, Ms. Shireen Allos, Miss. Noha Khalaf and Mr. and Mrs. Andy Anderson. Mini Vidas automated immuno-analyzer by Biomérieux. The above item was sponsored through the generosity of an anonymous corporate donor. Anti-Cancer drugs, anti-sickness drugs, painkiller drugs, intravenous fluids and nutrition, antibiotics and surgical items. Mudhaffer, Mr. Iradje Bagherzade, Mrs Charles Riachy, Miss. Rhea, Miss Talia & Miss Tara Tabbara, Miss Tamara Rasamny, Miss. Saryia Sakka, Mr & Mrs A Al-Farisi, Abingdon Peace Group, Mr. B. Tamimi, Mr. Frank Hind, Mr. Singleton, Mrs. B Rybacki, Mr. R Seabrook and Miss. Theresa Elwes. A panel of speakers and experts at MAIC's Forum on 'Health of Children in Iraq' held in London on 3 May 2005. In 2005, MAIC continued to asses its role in providing humanitarian aid to the children of Iraq. While MAIC believes its main mission of sending aid in the form of medicines and medical equipment is crucial, through dialogue with doctors in Iraq the charity has identified new needs. In response to increasing requests from doctors, some of whom have been working for the charity for 10 years, MAIC has recently launched a new training programme for doctors from Iraq. The programme aims to sponsor Iraqi doctors for short term training at UK hospitals in order to update their skills and exchange ideas with their British colleagues. Five doctors spent 4-5 weeks training in hospitals throughout the UK. The hospitals were the NHS and Social Care Trust in West Kent, the Maudsley Hospital in London, the Great Ormond Street Hospital, the Chelsea and Westminster Hospital and the Northampton General Hospital. Dr Abdul Kareem Salman Alobedi became the first doctor to benefit from MAIC's program. Dr Alobedi is a consultant psychiatrist at the Central Paediatric Teaching Hospital in Baghdad and the Chairman of the Iraqi Association for Child Mental Health. He spent one month training at the Northampton General Hospital in March 2005. His particular training program consisted of lectures, workshops and attending therapy sessions with both parents and childen in both a hospital and community setting. During his training, he was also able to hold discussions with the doctors at the hospital to explore setting up links between the Iraqi Association for Child Mental Health and the International Institute for Child and Adolescent Mental Health and Child and Adolescent and Family Services both in Northampton Hospital. Dr Alobedi feels he has gained a deeper understanding of child and adolescent mental health care, which he is pleased to relay to his colleagues back in Iraq. Since then, more doctors have also benefited from our programme, including MAIC member Dr Hussein Malik, a paediatric surgeon at the Central Paediatric Teaching Hospital; Dr Ali Hameed Rashid, a neuropsychiatrist at Yarmouk Teaching Hospital; Dr Said Nouri Al-Hashimi, consultant psychiatrist at Yarmouk Teaching Hospital and teacher in psychiatry at Al-Mustansiriya University, Baghdad. MAIC would like to particularly thank Mr Jack Piachaud, a consultant psychiatrist, who helped us raise sponsorship for their training and place them in UK hospitals. We would also like to thank Accenture and other generous donors for their invaluable support for this project. The total cost of sponsorship per trainee varied between £1,900 and £3,200, amounting to a total of £13,000 which covered travel expenses, accommodation and living expenses. We are also immensely grateful to the hospitals for providing the training free of charge. Based on the success of the last training program, MAIC is in the process of arranging another short training program for five doctors and nurses from the paediatric oncology department at the Basrah Teaching Hospital. The group of five health professionals includes a biologist, orthopaedic surgeon, haematologist and two paediatric nurses. MAIC is grateful to Karim Rida Said Foundation (KRSF) for its pledge to sponsor their training. MAIC is currently looking to find UK hospitals willing to accept the health professionals as observers for one month's training in 2006. MAIC held a Forum on the Health of Children in Iraq at the Royal Geographical Society in London on 3rd May 2005. This was an opportunity for doctors working in Iraq to share their experiences and discuss the current health situation and how the war and sanctions have influenced the diseases they encounter. The panel was moderated by Mr Robert Mabro CBE, a MAIC trustee and included four speakers: Dr Hussein Malik and Dr Ali Rasheed, who benefited from our short term training programme, Dr Jawad Khadem Al-Ali, consultant oncologist at Basrah Teaching Hospital, and Ms Lindsay Hillsum Channel 4 News International Editor. Dr Hussein Malik described how poor nutrition, a decline in educational enrolment and attendance, unhealthy lifestyles, high numbers of deaths from accidents and violence, and deterioration of preventative health programmes have contributed to the decline in the health of the Iraqi children. Poverty, poor sanitation and lack of uncontaminated water supplies have further added to this. Although since 1990 communicable diseases have not reached endemic proportions, infectious diseases remain the main cause of death in children, with acute respiratory tract infections and diarrhoeal diseases accounting for most of these. Dr Malik also noted an increase in typhoid, measles and mumps amongst the cases he sees. He also reminded us that Iraq used to have one of the best health services in the region, but believes that budget cuts, neglect and poor management over the last fifteen years have taken their toll on health services. This is further compounded by the fact that training of health professionals was neglected and professionals were academically isolated from the outside world and so unable to improve medical practice. Dr Malik also described the need, following the recent war, to renovate and develop damaged and looted medical buildings, rebuild infrastructure, re-organise the pharmaceutical sector and eliminate drugs shortage, training medical staff and tackle the main causes of communicable and other diseases. He concluded by saying that there has been significant progress made recently, with the rehabilitation and reopening of seventy five hospitals and nearly all primary care clinics that were damaged or looted in the war. In addition, public health programs have been re-established and national immunisation programmes organised. Dr Jawad Khadem Al-Ali talked about the effects of post-war environmental contamination on health in Iraq. He described how the drying of the marshes in the South and chemical contamination in the form of depleted uranium, used in the recent wars, have affected the environment and changed the spectrum of diseases seen in Basrah, where he works. Dr Al-Ali found increased rates of cancers, particularly leukaemia in children, increased rates of birth defects, changes in the pattern of cancer presentation, and the appearance of uncommon phenomenon, such as familial cancer clustering and double and triple cancers in one patient. Moreover, the shortages in treatment and nursing care have aggravated the problems. Dr Ali Hameed Rashid spoke about the effects of war on the mental health of Iraqi Children. He described the results of studies he and his colleagues conducted in Iraq, examining the many different ways in which Iraqi children are exposed to traumatic experience. These experiences include the death from armed conflict of one or both parents, siblings, other relatives, and friends, especially where death was witnessed by the child. Direct and indirect exposure to traumatic events, such as car bombs, forced evacuations from family homes and cities, abductions and other violent experiences lead to severe and disabling psychological damage. The continuous exposure to trauma, along with other factors such as, the absence of qualified mental health aid, escalation of the violence, the poor understanding and handling of their psychological problems at home and school and the absence of psychosocial support has made traumatic disorders in children not only more widespread but also more severe. Ms Lindsay Hillsum, Channel 4 news International Editor, also spoke of her experiences in Iraq at the event. She described numerous moving stories of people she had encountered during her visits in Iraq; stories of heroism and tragedy. MAIC would like to take this opportunity to thank all those who spoke at the Forum and who came to support the event in particular our experts on the panel: Professor William Yule, Director of the Child Traumatic Stress Clinic, Maudsley Hospital, London as well as Dr Penelope Brock, Consultant Paediatric Oncologist at Great Ormond Street Hospital, London. MAIC would also like to thank the International Arab Council Charities Fund (IAC) for generously sponsoring the event and all our kind donors who made this event possible. MAIC wishes to thank all foundations, organisations, companies, fundraisers and individuals, who have so generously donated their time and resources to MAIC. The following is a list of organisers who have held fundraising events since January 2005.  Rev'd John Stephenson for continuously raising funds for MAIC through writing and selling his books.  Norwich & District Peace Council for funds raised through selling white peace poppies.  Chester Coalition Stop the War for funds raised through its awareness campaign.  Christ Church Anglican for funds raised through its Christmas appeal.  The Convocation of American Churches in Europe for funds raised for MAIC.  Kendrick School for funds raised for MAIC.  Mona & Zahra Haidar for raising funds at school.  The Boston Foundation for funds sent to MAIC through CAF America.  Ortho Clinical Diagnostics for funds raised for MAIC.  The Royal Airforce Stafford for funds raised through collections made at various church services over the Christmas period in Basrah.  Code Pink Women for Peace for sending MAIC a donation on behalf of their organisation.  The American Cathedral in Paris for funds raised from a collection .  Owestry Coalition for Peace for funds raised at a concert held in aid of MAIC .  University of York Students Union for raising funds for MAIC through holding a fashion and music show.  Miss Talia and Tara Tabbara and Miss. Saryia Sakka for funds raised through babysitting and selling MAIC charity wristbands.  Imperial College London for holding an Arab Asian Fusion charity dinner and raising funds for MAIC.  The Church of Christ the King raised funds for MAIC.  Friends of Church of Christ the King raised funds for MAIC.  Mr. E Daniel for forgoing birthday presents and advising friends instead to donate to MAIC.  Mrs Henley for forgoing 80th birthday presents and advising friends instead to donate to MAIC.  South Hampstead High School for funds raised through collections over the academic year.  Mr Paul Ridley for raising funds through sponsorship of his London to Brighton Bike Ride.  Mr & Mrs Davies by very generously forgoing a wedding gift from Mrs Linda Lewis who donated to MAIC instead.  Miss Rhea Tabbara raised funds from working in a boutique during her summer holiday.  Mr Martin Wyatt & Miss Nicola Greenwood for funds raised by very generously forgoing wedding gifts and advising friends to donate to MAIC instead.  Miss Maysa Ibrahim for funds raised through an Iftar meal.  Miss S Fowler raised funds by holding a collection at her meditation group.  The Link Assets Security Company for funds raised through a charity day.  Totley Athletic Club for funds raised for MAIC.  Abingdon Peace Group for funds raised for MAIC.  Miss Joanna Eden for writing and recording a CD for MAIC to raise funds through its sale.  Mr. Hasan Haboubi, Mr. Ali Latif, Mr. Ian Davies, Mr Khalid Ali and Ms Najwan Abu Al-Saad for raising funds for MAIC by participating the BUPA Great North Run.  The late Mrs Angela Bushara for funds raised through family and friends in memory of her.  Miss Tamara Kosta and Mr Soykan Sayucayli for very generously forgoing wedding gifts and advising friends to donate to MAIC instead. 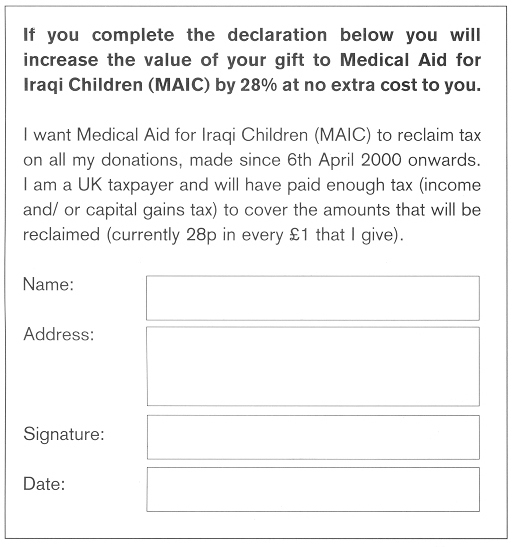 Medical Aid for Iraqi Children (MAIC) is listed on the Inland Revenue website for donations. If you use the Self-Assessment returns system and wish to donate to MAIC, please use MAIC's following code number EAR14QG.  Medical supplies based on lists of particular needs of Paediatric hospitals i.e: antibiotics, cancer drugs and surgical items (Total Value: £150,000).  Wheelchairs and crutches (Total Value: £25,000).  Reagents and solutions for a radiometer machine previously donated by MAIC to the Children's Welfare Hospital. (Total Value: £12,000).  Diagnostic equipment, i.e: 8 Billimeters, Teaching and Ordinary microscopes (Olympus) and 12 IV Fluid Infusion pumps (Total Value: £100,210).  MAIC will also sponsor the training of five doctors and nurses from Basrah Teaching Hospital's Oncology Department. Funding for training has been generously pledged by the Karim Rida Said Foundation. MAIC is working to secure placements for the five medics at UK hospitals.The charity needs to raise £300,000 to cover the cost of its medical projects in 2006. All donations will be most appreciated.